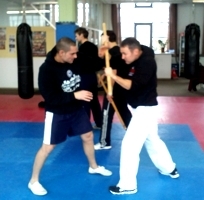 The Hammer Concept Half Staff method turns your umbrella, walking stick or similar object into an effective weapon for self-defense. The term "Half Staff" stands for a stick of approx. 1 meter in length. In other martial arts and fighting systems it is also known as Hanbo or Jo. In the Hammer Concept Protection the half staff represents a stick or object from 60 cm to 160 cm in length, e.g. umbrella, walking stick, spade, mop etc. A lot of common objects of this length can be unconspicuously carried or can be found in the immediate vicinity. The half staff or suitable common objects serve as power amplifiers and could equalize a possible physical disadvantage. 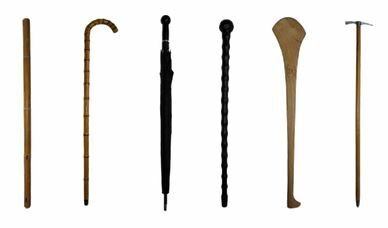 A determined Hammer Concept practitioner can turn an umbrella or walking stick into a very dangerous self-defense weapon.